I pulled this collection together after taking the "Design Surface Patterns From Scratch with Bonnie Christine" course on Creative Live. I took the class because I was wanting to improve my Illustrator skills. There are 31 segments that guide you from the basics of setting up files and getting to know the tools all the way through presenting your finished designs. Bonnie covers turning photos and sketches into finished designs and setting your prints into repeating pattern. A new print collection, Happy Camper, in process, with much work to be done. Inspired by Mara Hoffman's swim collections and keeping the Stylesight Spring 2015 Megatrend "Impulse" in mind I came up with three coordinating prints. I've been intrigued by woven textile traditions from the "Americas" lately, and I think that crept into the stripe a bit. I've been fascinated with the similar qualities in Navajo, Mexican, Columbian, Peruvian, Guatemalan and even Inuit textiles. I ended up blending two different design briefs into one collection. 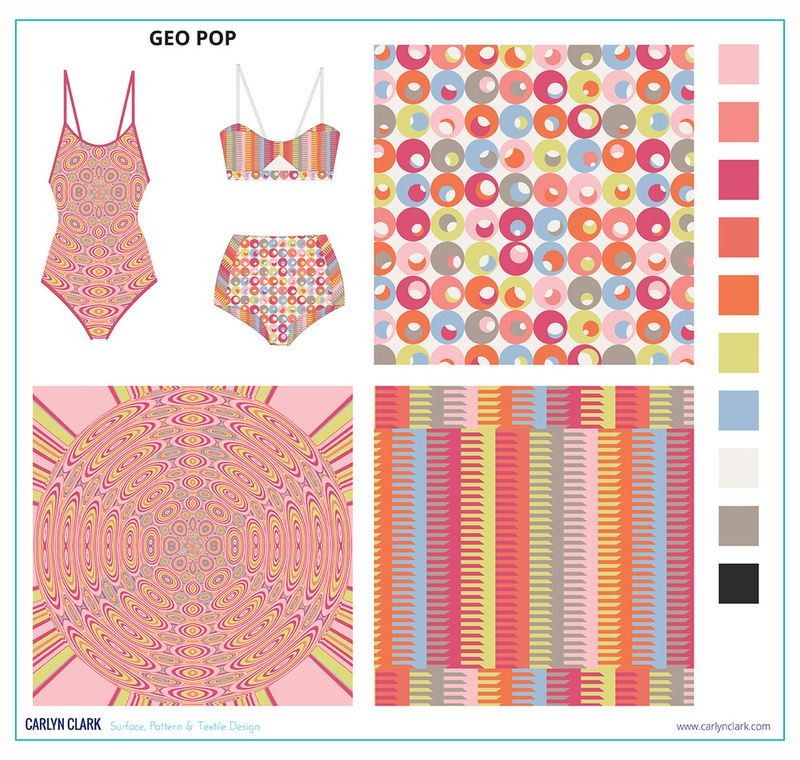 Over on Pattern Observer, Chelsea's Challenge has a "Runway Inspired" brief, and the Make It In Design School Summer School Intemediate level brief was for swimwear with a "fun retro inspired pattern". Specific details were to "think large-scale motifs, including at least one strong bold geometric shape. The process I use as I start to develop a new collection of prints and patterns.